So our dog got a hold of our antenna and chewed the cord. I lost all remote connection but was able to repair the line and put everything together. 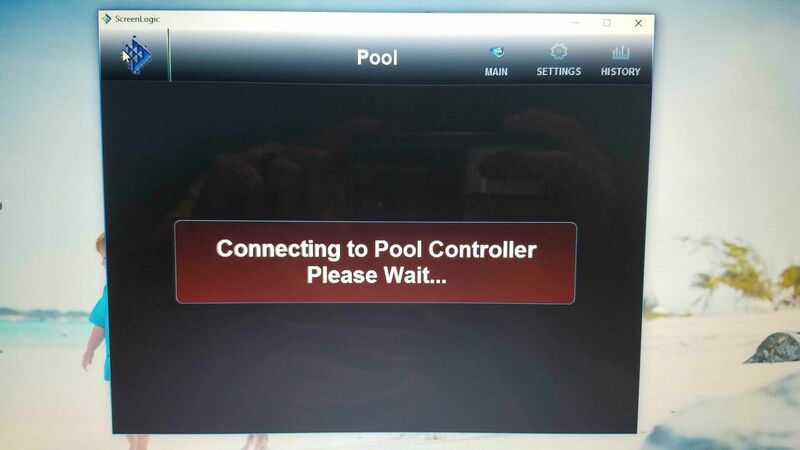 Now the Pentair remote works as it should but when we log in with our phones or computer it logs in but not data on the pool shows up. 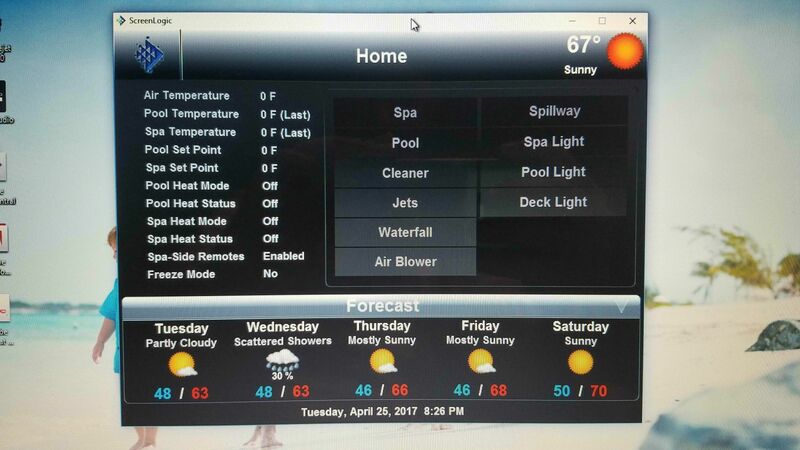 Cant control anything with the phones or computer only with the control panel or Pentair remote. Any ideas of what I should try until I am able to get a hold of either Pentair or our PB? Thanks! What happens when you shut down ScreenLogic and then go into the "Configure ScreenLogic" icon? There was a similar post about the ScreenLogic not being able to connect through the OPs home network, and it was due to the ScreenLogic having a default gateway (network address) setting of 192.168.1.1 For some reason the ScreenLogic reset itself to its default settings. Many home networks use 192.168.0.1 so the fix was to go into the home router settings and change it to use 192.186.1.1 (which will then break all your other network devices connections) however then once the ScreenLogic was connected you could then change the gateway address in ScreenLogic settings back to use the homes gateway of 192.168.0.1. 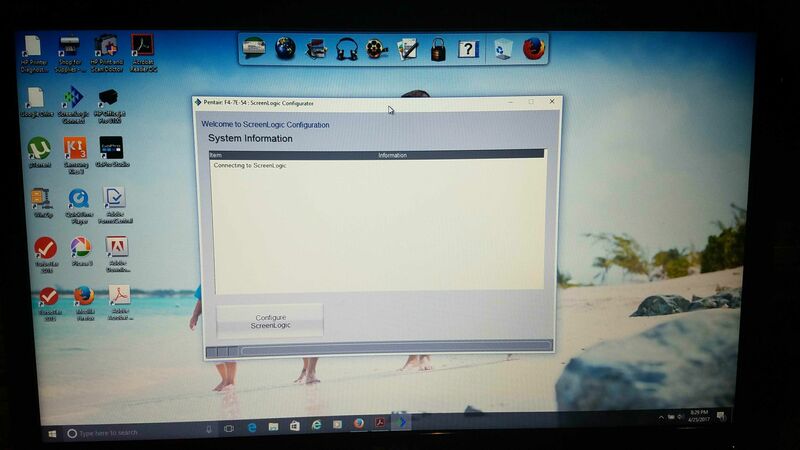 Why does the Configuration program say “Looking for Controller”? a. Wireless Tablet – Press the Suspend button located on the left-side of the Tablet for approximately 4seconds. The Tablet reboot process will take approximately 20 seconds. b. If step 1 does not fix this issue, go to step 2. 2. Locate your ScreenLogic2 Protocol Adapter and wireless router. Verify the wireless router Power LEDin on. These two devices should be located near one another. Cycle the power to both of these devices.You can use a paper clip to reset the Protocol Adapter by pressing the recessed reset button. You canunplug and plug back in the wireless router to reset it. 3. Verify the wiring to the protocol adapter and IntelliTouch Load Center. It appears to me that you have lost your link between the EasyTouch and the inside transceiver. 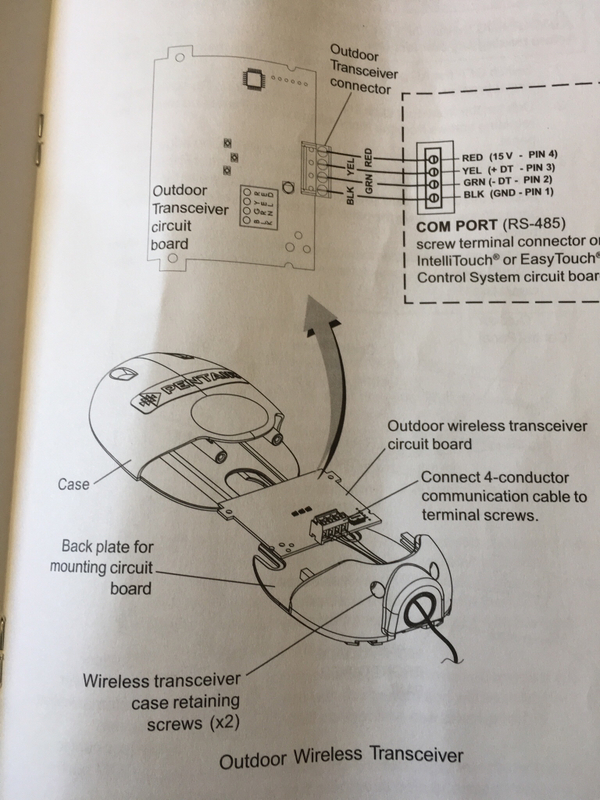 When you were fixing the remote wiring did you screw with any of the communications ports? 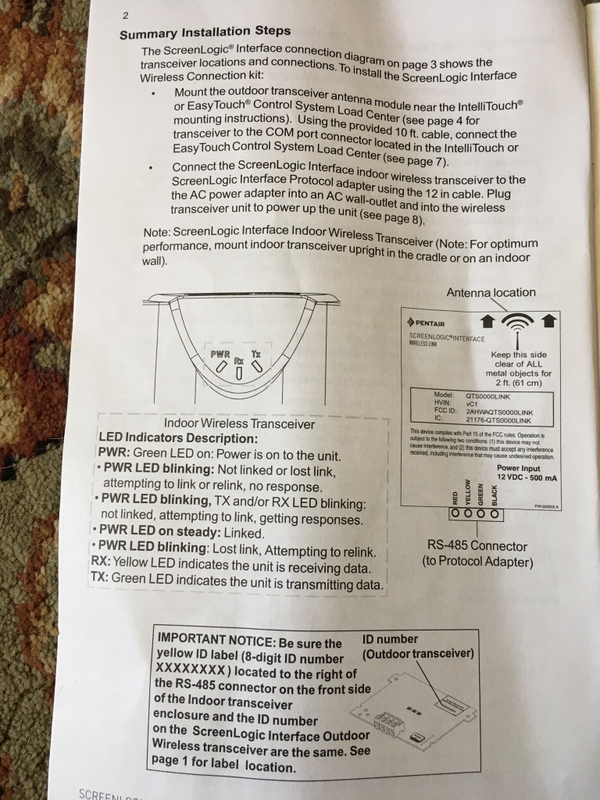 I don't use the wireless link, so I'm not up on the part, but I'd use the manual and try to get the link working. Have you tried rebooting the protocol adapter. It's the brick that the cat 5 cable is connected to. I'd unplug the power cords and try it again. Yeah I've power cycled the Comcast router and the Pentair units along with a reset. The Screenlogic shows up on my network but for some reason has lost touch with the main panel for info and control. Go into your router settings program and see if the Pentair protocol adapter is showing as active or inactive. If shown as inactive, and you have rebooted everything then your Protocol adapter has died. I have had two adapters go bad with similar symptoms as yours. Both of mine died within a year of purchase, and Pentair overnighted new adapters in each case, with no return required. My current adapter is going on 1 1/2 years now, so mabe they fixed the problem (Ethernet interface hardware problem). I otherwise love my ScreenLogic and would not have the Easytouch without it. Dumb question. Did you make sure the wires were connected to the correct terminals? Since your other devices are working it's definitely an issue with the protocol adapter, your wireless link, or the wires not being connected correctly. What I would do if you have the ability is to do this. Direct connect your protocol adapter to the ET panel and your network router or switch via hardwire. Get a 4 conductor cable 18-22 awg and use it. Remove the wireless link from the picture. If that works you know your protocol adapter is good and the wireless link is bad. I've had nothing but problems with mine and saw the same thing as your last picture. I also uninstalled and reinstalled all the apps on the phone and pc just to be sure. Here's the info on the wiring. Yeah the wiring is right, I didn't need to change anything on the wireless system inside, only the one antenna outside. I wired it up the exact same way as it was when I took it apart. It's the strangest thing. Hopefully my PB will be back in town soon to come take a look.